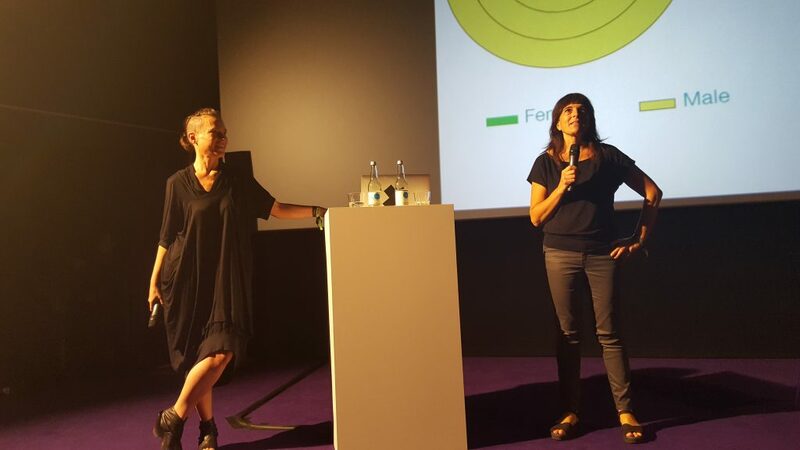 “Facts 2017 – what needs to be done?” The new facts were presented at the Pop-Kultur Festival in Berlin on 25.08.2017 and discussed with Sky Deep and Marlene Engel. These are some impressions of the presentation. You can read here the introduction to the facts survey and the discussion. The female:pressure FACTS survey is a biennial project undertaken by volunteer members of the female:pressure network. Starting in 2013, the FACTS survey was initiated to address and quantify the deficit in equal opportunity and visibility for female artists in the electronic music scene. 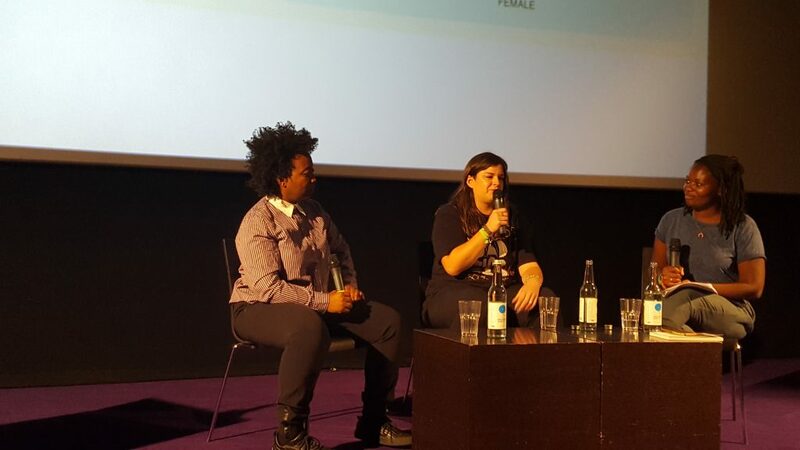 The result of the 2013 FACTS survey indicated that barely 10% of artists listed in festival line-ups worldwide are female–and opened up an international discussion about the state of women in electronic music. In 2015, we conducted the survey anew. 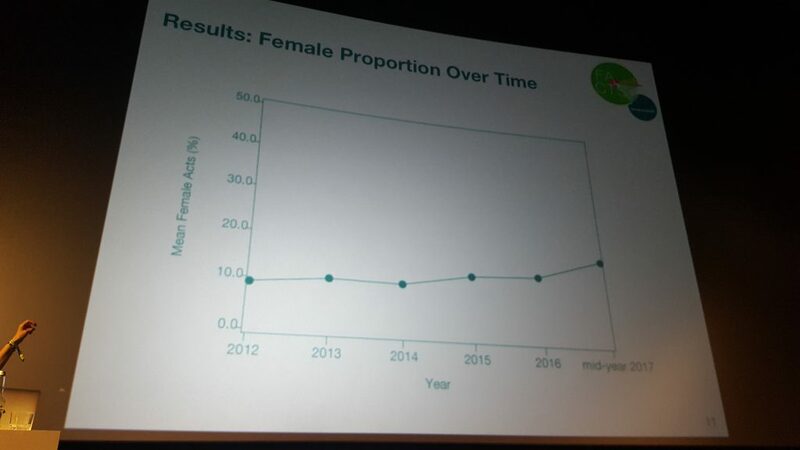 Although the inequities within the industry had become a popular topic of debate since the 2013 edition, the 2015 FACTS survey demonstrated the continued lack of women on music festival line-ups. While this phenomenon is receiving more media coverage today than ever before, we believe that measuring trends through the FACTS survey is necessary to understand the true state of inequity in the electronic music scene and to hold decision-makers accountable within the industry. We embarked on FACTS 2017 with the goal of assessing the female-male-mixed [i.e., acts comprised of both male and female artists] gender proportions among artists performing at music festivals in the years 2015, 2016 and the first half of 2017 with a focus on the year 2016. Even though we included many new festivals for this year’s edition, our emphasis remains on the regions of Europe and North America. 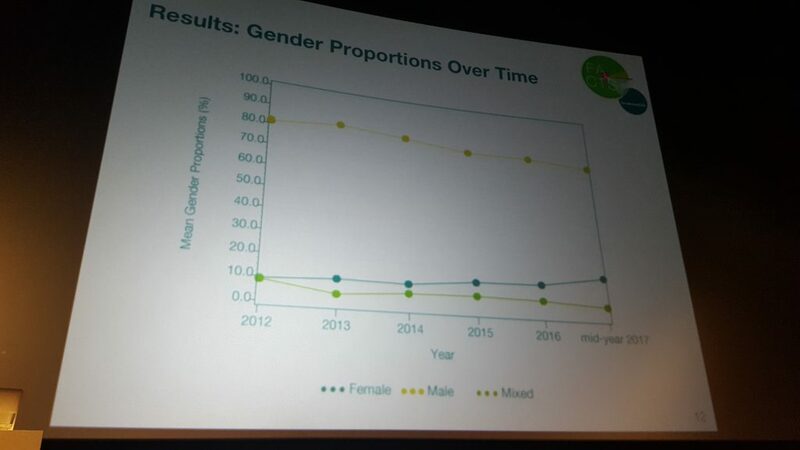 In gathering data from these years, we aim to assess both time trends from 2012 to 2017 and country specific female-male-mixed gender proportions. With 229 festival editions, it is the most comprehensive FACTS survey yet. For this year’s FACTS survey, our team asked each one of the included festivals to participate by submitting their own numbers. Twelve of the 133 festivals responded and filled out our data collection form. In surveying more festivals in more countries than ever before, we may see the extent to which inequity is a systemic issue. Structural sexism perpetuates inequality by creating barriers and disincentives for women, which limits women’s success in the arts to genres and media aligned with the status quo. Although progress is certainly being made with respect to the visibility of women in the industry since the 2013 FACTS survey, we are reminded that mere coverage or visibility can not substitute for systematic change. Cultural change is indeed happening, as we see overt sexism and prejudices “called out”, but structural change is necessary to truly addressing underrepresentation. As musicologist Elizabeth Keenan argues, solutions must simultaneously address gaps in education and access for female artists. Our FACTS survey, like the female:pressure network, is the result of grassroots activism–conducted independently from any for-profit organization and without external funding. The 2017 edition of the survey was undertaken by six core volunteers, nicknamed the “Trouble Makers,” with the aid of seventeen helpers. In our present survey, assessing festivals acts from 2015 to mid-year 2017, we found that 15% of all acts were female while 78% were male. We saw that, although the rate of female acts rose slightly over the years, there is still an enormous gap between female and male artists appearing on stage. Thump [a subsidiary of Vice] conducted a similar survey, focusing specifically on electronic music festivals, in 2016. The scope of this survey was much smaller than the FACTS survey: Thump tallied only 24 festivals [all taking place in the first half of 2016] and they did not account for mixed acts, instead counting all mixed acts as female. The Huffington Post also conducted a music festival gender parity survey in 2016, though they considered a broader range of genres. Again, the scope of this survey was much smaller than the FACTS survey: 10 festivals’ line-ups over 2012-2016 [50 editions total]. However, like the FACTS survey, Huffington was very transparent about their methodology. 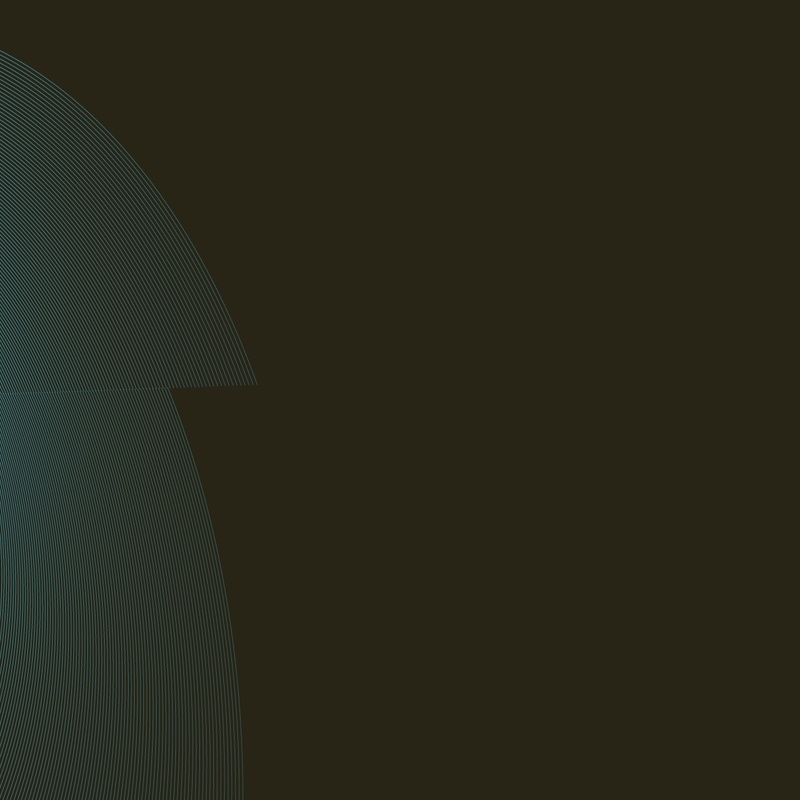 Pitchfork also conducted a similar survey in 2017, though the scope was multi-genre and included only 23 festivals, for a total of 996 acts counted. All three of these surveys came up with very similar percentages: festival line-ups on average include only 12% – 14% female acts, and on average only 10% – 12% mixed acts. In 2016, Deutscher Kulturrat [an umbrella organisation of German cultural assemblies] published a very comprehensive study about the job market development for women in culture and media in Germany. The report comprises data mostly retrieved through administrative bodies, covers a time span of 20 years and a variety of sectors. For the music sector, the study does not draw any distinction between musical genres but rather between kinds of occupation. The analysis is based on the amount of insured persons and their income. Thus, a direct comparison with our results for an international electronic music scene and the representation of women in festival line-ups does not make much sense. However, it is an interesting example of a gender survey even if its aims differ from our own. There is an article in English about this study, too. In the course of conducting the survey, it became quite obvious that counting female, male and mixed acts is not as simple as it seems at first glance. Thus, it was important that we make clear guidelines for how to count as accurately and consistently as possible. Due to the grassroots character of the whole undertaking and the amount of helpers and contributors involved, these guidelines [which you can read in the “Methods” section] were often partly overlooked or maybe also misunderstood. Some not-so-easy-to-answer questions were raised. For example, how should we count an act who is announced under a single, easy to identify artist name but who actually performed with other musicians, singers, or visual artists with different genders who are not listed in the line-up? Even if you were present at the performance, you might not have seen everybody on stage. Such incidents often depend on insider information to be aware of them at all and lead to varying results for the very same festival edition. 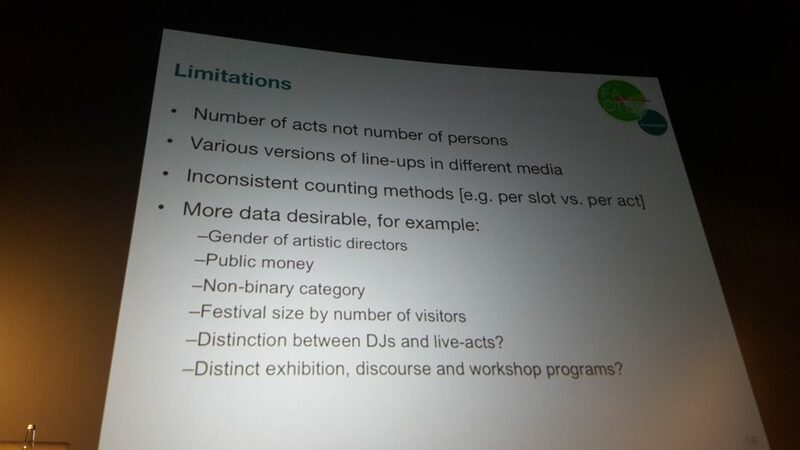 All data collected is based on the unit “act”, not the single artists on stage/number of persons an act consists of. Assuming there is no systematic gender difference in the number of persons in male or female acts would yield a similar gender proportion regardless if acts or persons are counted. If this assumption holds, however, is unclear. Another, very frequent phenomenon was the presence of different information about the same festival edition in different media. 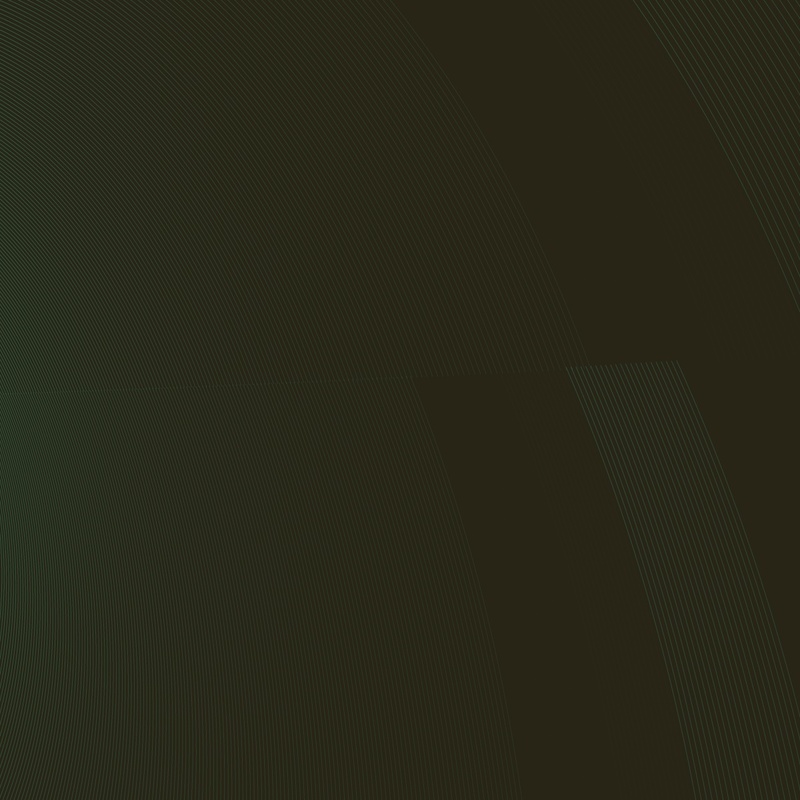 Resident Advisor would show different numbers of acts than the Facebook event, for example. Festival programs are updated frequently and various versions of them can be found online. Quite a few websites or single web pages disappear or substantially change over time which makes it difficult to find out who played if we were trying to evaluate numbers submitted a year or two ago. On the other hand, it is a huge advantage to have so many helpers who are directly involved in the scene we examine and thus know many artist names anyway and can be a lot quicker assigning them to one of the three gender categories we had so far. We would have liked to verify the data more than we did. We reviewed 78 of 229 festival editions for the current survey but lacked time and womanpower to re-count more editions. This is mainly due to the whole project being based on voluntary work without any financial support. Nevertheless, even if some numbers might be less accurate than we aimed for, the overall result would only be affected to a minor degree. In addition, we do not assume that any potential errors in counting the festival acts are systematic but would rather be random. Thus, errors should not systematically bias the results in one direction but even each other out. Another possible factor that would result in distorted results is “selection bias”. For example, organisers of festivals with a higher number of female acts might be more willing to take part in the survey; this would lead to an overestimation of female acts. A solution to this bias is to try to count all existing electronic music festivals. In addition, since data was provided by festivals organizers for only 23 of the 229 [10%] festival editions for 2015-2017, and 90% of data was assessed by the “Trouble Makers” group, we don’t consider this type of bias to be relevant. 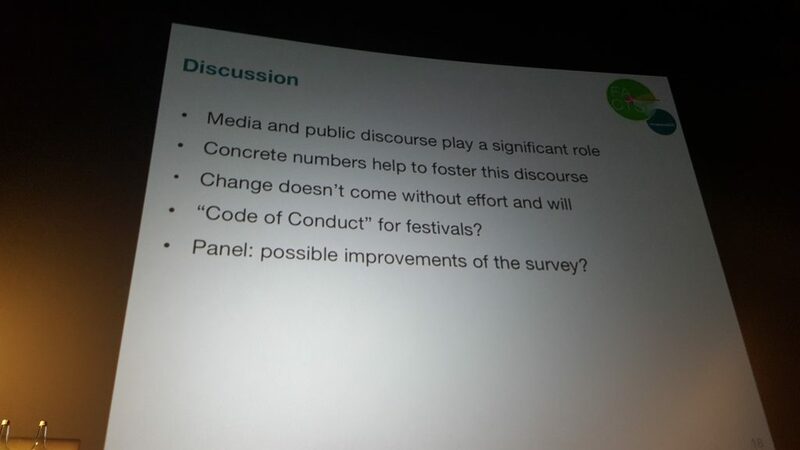 Up to now, we did not take a very important factor into account: Does the festival receive public funds? We think that with receiving grants from governmental authorities, i.e. tax money, the obligation to program a fair and diverse line-up is even more pressing. We would be interested to compare the factors “public funds” with “gender proportion.” There is reason to believe that line-ups of festivals who receive such funds feature more women as these cultural grants and subsidies are often subject to regulations concerning gender equality. A publicly accessible resource where information about the financing of festivals can be retrieved would be extremely helpful for assessment of this issue. It is obvious that electronic music festival line-ups in at least Europe and North America are dominated by white people. This is particularly striking as electronic dance music originates from black and latinx communities. Without these DJs, artists, and audiences of colour we would not even be able to examine what we are examining now. We are very interested in surveys that have a look into the overall quota of people of colour invited to play at such festivals. And we are specifically interested in the representation of women* of colour in this scene. We are also wondering if the gender and number of festival bookers, curators, and/or programmers affect the gender balance of line-ups. Is it a single curator who might act as an impresario or is it a team of curators? Do female bookers book more female artists? Or could it have a contrary effect that women responsible for a festival’s program need to over-fulfill a “relevance” criteria and thus book the most hyped and therefore mostly male artists? A study like the aforementioned “Frauen-in-Kultur-und-Medien” by Deutscher Kulturrat which investigates the income development of professionals in culture and media would be extremely helpful to complement our surveys if it distinguished musical genres and, ideally, compared several countries. 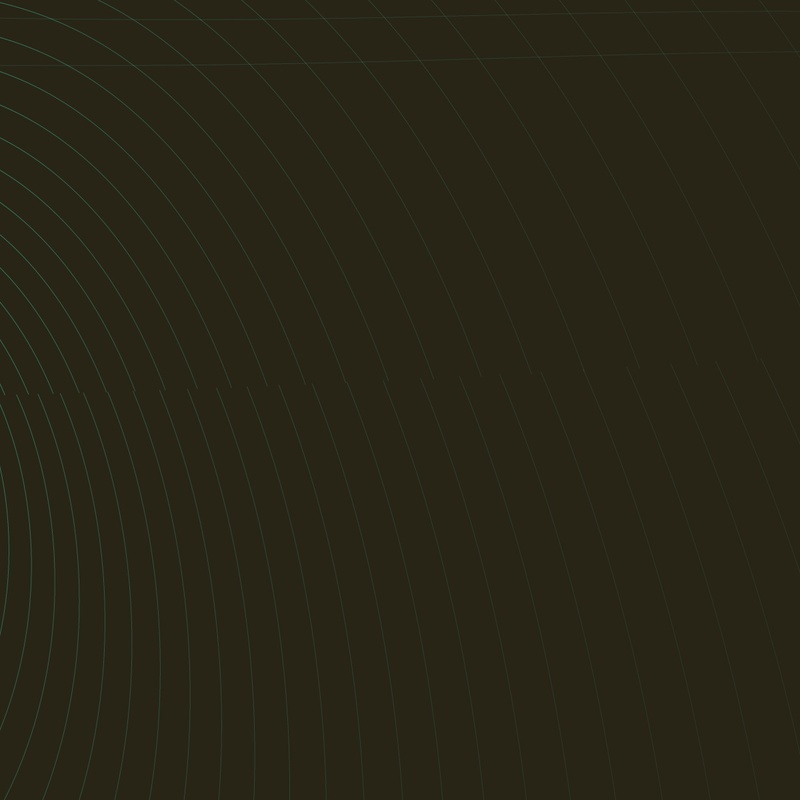 We would like to see and eventually also contribute to a code of conduct: a guideline for best practice for festivals to accommodate the societal and cultural implications that their programs, advertising, and publications produce. We think it is never and has never been “just about the music”. There is much more to a festival than that: the achievement of relevance, economic success, social factors–many times on a very personal level–the advancement of a genre [“adventurous music”], political factors and/or other agendas. We also would like to put more thought into how we categorize non-binary artists, which the current male/female categories do not account for. The results of our FACTS survey show that little has changed in terms of the representation of women in festival programs. 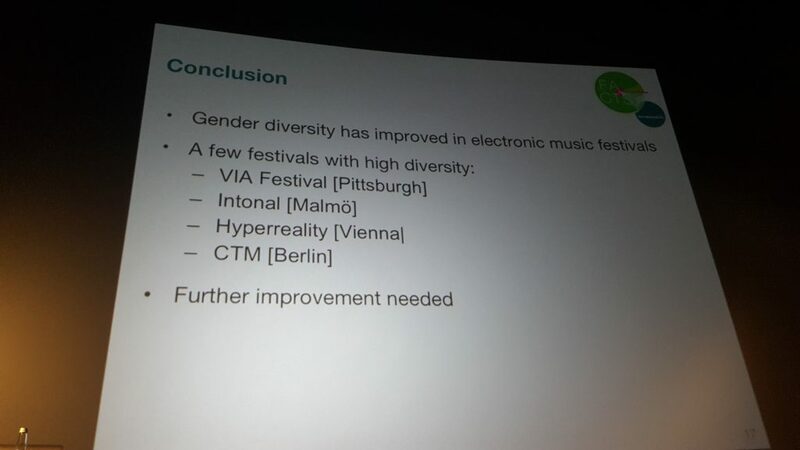 But there are festivals which can be seen as best-practice examples to increase the diversity in line-ups: VIA Festival [Pittsburgh, USA], Intonal [Malmö, Sweden], Norbergfestival [Norberg, Sweden], Hyperreality [Vienna, Austria] and CTM [Berlin, Germany], for example. First of all, pursuant of an ethical and political agenda that acknowledges the importance of equal rights and meets concerns about the discrimination against all those who are not white and male artists: Believe in a multi-faceted and heterogeneous electronic music scene. Believe in a less capitalistic approach to your listeners and support a more performance-oriented music culture. Book more women, non-binary people and people of colour. If you believe they won’t fit your crowd and/or won´t bring in enough money, invest in good press work, install or support underground stages and generally promote a vibe of inclusiveness for your event. Network and collaborate with more booking agencies that have a diverse roster of artists and inform yourself about and/or connect with festivals around the world that make an effort to include equal numbers of women and strive for overall diversity in their line-ups. On the organisational level: Install a mixed-gender team to program your festival’s line-up. If you are interested in making a change and representing more women, non-binary and people of color in your festival program–thereby reflecting the state of the art in electronic music–make, for example, a public call for participation and describe how you want electronic music to be represented within your festival. We could therefore imagine that festivals reserve a part of their line-up for those artists who get booked through a call which invites especially female artists, non-binary artists and artists of colour. Support your local underground scene, connect with record dealers and music journalists who are basically experts in the field. If you have the capacity, host a workshop and discourse program and invite especially women, people of colour and newcomers as panelists and participants. Topics might range from gear, music production, mastering to publishing, music promotion and other music business-related issues. By supporting workshops for music production and DJing, people get connected and informed about the scene so that they can support each other and maybe get booked for your festival the next time. We also suppose that the relationship between artists and festival promoters will change then. The workshops and discourse program can be funded in a variety of ways, from ticket sales to donations and fundings [e.g. socio-cultural programs]. When looking at the working conditions of your festival, be aware of the special needs for women and parents in general which could mean installing a system of cooperative and safe child-care for artists’ and staff’s kids. There are initiatives like the Clubcommission Berlin who want to represent the gateway between clubs, promoters, industry and cultural policy players. Initiatives which engage in the needs and perspectives of the different protagonists in club and festival culture could function as an umbrella organisation for festivals, too, and collaboratively work out guidelines which could be developed into a certification. If a festival successfully follows these guidelines, they can promote the festival with the logo of this certification. With focus on the artists, we have a few more suggestions: Connect yourself with local and/or global networks and resources for women and non-binary artists, you can find a lot of them on the female:pressure website. Some male artists already show solidarity with their female colleagues and refuse to play if there are no or not enough women on the line-up. We think this is a great strategy that makes promoters and curators question their policies! Current Research / Diversity, Female:Pressure, Feminismus, Festivals, Gender, Networks.